My Partner Also Has a Chronic Disease. The CHRONDI Creed Helps Us. There are quite a few articles that talk about caregivers supporting a person with a chronic illness, and that caregiver is usually the spouse. But what is it like when both people in the relationship have a chronic disease? There is a lot less information out there about this predicament and what people can do under these circumstances to maintain a high quality of life. My partner and I have found that the CHRONDI Creed helps us. When one partner has a chronic illness, 75 percent of marriages end up in divorce. These couples also suffer high levels of stress and burnout — mental health issues. This has a serious impact on the health of the family. Writers have offered helpful suggestions on how to limit the negative relationship effects of chronic disease, such as working through frustration and addressing irritability. There are also good sources that provide a literature review of self-care, a review of chronic illness as it overlaps with getting older, and a list of reading materials on caregiving. This information can be applied to the dueling chronic disease dilemma, but none of these articles accurately articulate the chaos that happens. When both people in the relationship must deal with their own chronic illness and then be there to help their mate with their issues, chaos ensues. There is just no way around it – couples argue and fight. It’s made worse when both have a chronic disease, with the accompanying issues and needs that must be met. It’s a swirling storm, and you either decide to travel through it together or you decide to go your separate ways. We have decided to commit to doing whatever necessary to make the journey easier and healthier for both of us. This is where the CHRONDI Creed comes into play. Compassion (C-CHRONDI) is the foundation for success: taking the time to hear each other’s needs and respond with a gentle heart. Many of these needs fit into the care demands of disease management (R-CHRONDI), but relationship health must address more than the dueling illnesses. Couples need to experience times of shared happiness (H-CHRONDI), take walks together embracing nature (N-CHRONDI), and support each other with the development of identities separate from the illness (I-CHRONDI). There is a plus side to both partners having a chronic illness, which is that both are experiencing loss of function (D-CHRONDI) and both benefit from the support of others beyond the relationship (O-CHRONDI). We both have agreed to put the CHRONDI Creed in place as an umbrella to help us weather the storms we encounter. It is a shared journey, with each of us taking turns holding the umbrella against the fierce winds. Our relationship has its rough times — fortunately not that often — but it is filled with mutual interests, love, and a spiritual/soul connection. When the warranty on the body runs out and you can’t get new parts anymore, it is these nonmaterial qualities that bring strength to the relationship. We have always been each other’s best friends, and even in the darkest of times, one of us shows up to hold the umbrella for the other one. Do you and your partner both have chronic illnesses? Use the comments section below to talk about your experience and your coping strategies. The post My Partner Also Has a Chronic Disease. The CHRONDI Creed Helps Us. appeared first on Parkinson’s News Today. https://www.pdlink.org/wp-content/uploads/2019/04/Dueling-Diseases-1024x434.jpg 434 1024 AMPadmin https://www.pdlink.org/wp-content/uploads/2018/01/BL_PDlink-name_v2_logo_header_linked_pd_copy7_large-300x138.png AMPadmin2019-04-12 09:05:492019-04-12 09:05:51My Partner Also Has a Chronic Disease. The CHRONDI Creed Helps Us. My previous eight columns addressed the CHRONDI Creed, a plan anyone can put in place when seeking to live better with a chronic disease. The CHRONDI Creed is challenging to put in place as a way of life. It takes courage to face life honestly and to make the changes needed to move toward well-being. It takes courage to wake up every day with a chronic disease and to stand tall with the CHRONDI Creed as your action plan. Life is about choices. Using the CHRONDI Creed is a choice. I could say to myself, “I am tired of having to do all this hard work.” And on bad days, that voice gets annoyingly loud. That voice was particularly loud while driving to my monthly doctor’s visit for my other chronic disease, ocular histoplasmosis. It’s an eye disease, and I need chemo treatment injected in the eye every month. This treatment is scary. Imagine watching a needle coming straight for your eyeball and then watching the fluid being injected. Imagine the thoughts and fears. I sign a waiver every time because of the risks involved with this treatment. Do I want to want to do this? Dumb question, right? But if I don’t do it then there is a chance the disease will eventually take my sight. It’s a choice. I could choose not to do it, but instead, I choose to face this scary treatment every month. Courage is not the absence of fear, but rather facing fear and doing what promotes health. R – Rehabilitation: I will apply courage and mindfulness to a total health rehabilitation plan. O – Others: I will genuinely communicate with others about my experiences and maintain an attitude of gratitude for their help. N – Nature: I will take time to embrace nature and all its beauty, which may include gardening, walks in the forest, and just sitting with nature. D – Death: I will find the courage to face the terror of the “death of self” (loss) and not let it control me. I – Individuality: I will continue to express my individuality and my purpose beyond the disease. The CHRONDI Creed is a series of self-affirming statements. (For more detailed information about each one, click on the links above.) I start each day with these statements and have been doing so for years. They have become my inner dialogue — most of the time. It’s a healthy inner dialogue to replace all the negative, sometimes nasty, inner noise. Keeping that negative noise numbed down to a level of minimal impact is an important part of my personal plan for well-being. I have found that the CHRONDI Creed gives me more strength, helps me to have more courage, and adds to my quality of life while living with a chronic disease. I am always looking for a way to live the creed more completely. Where have you needed to draw upon courage in making choices to live better with a chronic disease? Please share in the comments below. The post Finding Courage to Face Life by Using the CHRONDI Creed appeared first on Parkinson’s News Today. The disease thief robs us of so many of the ways by which we know ourselves. It is a death of the self that is a casualty of chronic disease. The death of self needs to be addressed with as much mindfulness as any other part of the creed for total health to be maintained at the highest level possible. The time and money spent on four college degrees are behind all the years of experience expressed in the above list. Now all are casualties of a chronic disease. It is the death of self. Looking in the mirror, past the gray hair and crevasses of age, deep into multicolored eyes, I found nothing that I remembered as me. The self I once knew was gone — dead! I was sitting in a void in a life without meaning, with nothing of familiarity. From my clinical work, I knew that people get lost when this happens. It can be quite difficult to find the way back. I also knew something about this journey from mystical teachings, but knowing and living through it personally are two different things. Somehow, I had to find my way out. I had to heal from the death of self. We can apply stages of grief to healing from the death of self. As I mentioned in the disease thief column, we should use terror management should as needed. And it is important to have a support network through the process, including peers, family, and technology. Additionally, the CHRONDI Creed can be used to help with healing, particularly the “I” in Identity. I will cover that in the next column. Have you experienced the “death of self” while battling a chronic disease? What progress have you made? The post The Death of Self: A Casualty of Chronic Disease appeared first on Parkinson’s News Today. The “O” in the CHRONDI Creed stands for “others” — the other people around us who support, teach, and love us, and who pray and care for us. Other people can also provide a mirror that helps us to see how others perceive our actions. If we can objectively view this reflection, we can gain wisdom about the consequences of our actions and then make informed choices that will affect how we interact with others. 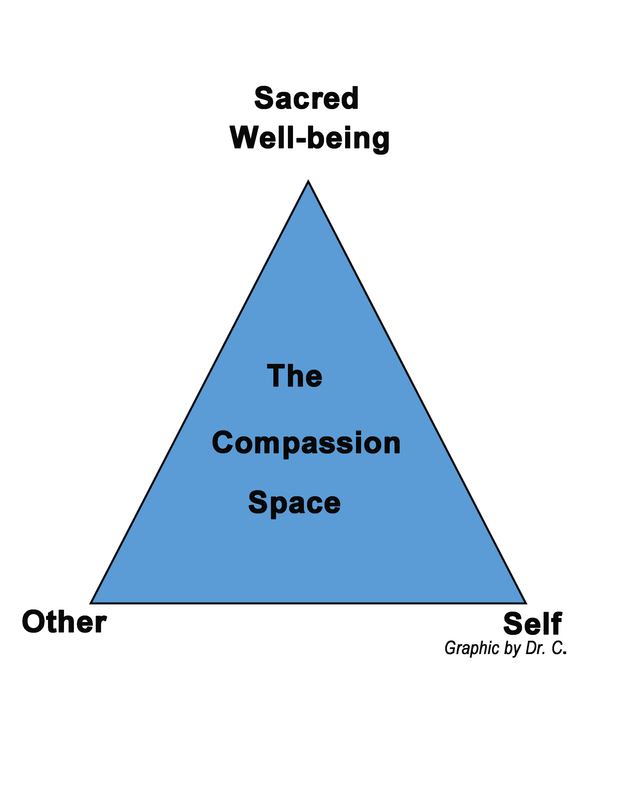 The relationships we have with other people provide support and a mirror seen clearly within the compassion space (see diagram below). Columnist Sherri Woodbridge has written about relationships while dealing with Parkinson’s disease, saying that we need to work on keeping relationship magic alive. She advises readers to seek help with relationship issues rather than ignoring them. It takes work to keep relationships healthy and growth-promoting. We don’t put our foot into the stream of life the same way twice — our lives continuously change, and our relationships need to adjust to these changes. Growth-promoting relationships with others happen within what I call the “compassion space.” It is a shared space between the self and the other and our well-being possibility. Movement also takes place within this space. Reaching out to the other and then retreating to self (“push the person away” and then later “seek to get closer”) is one of the most common relationship dances. A similar dance happens when we seek to help someone achieve well-being or receive assistance with our own health. It is a dance of getting closer to well-being and then retreating from the experience. I have termed this “compassion space resistance,” and it is the primary source of compassion fatigue. The latter does not arise from successful compassion that leaves one with more energy than it takes. Compassion space resistance can drain emotional energy and lead to caregiver burnout. Imagine that your lifelong partner has a chronic illness. You want to help your partner move toward a place with less suffering. But compassion resistance can happen if you spend days arguing, your partner neglects his rehabilitation plan, or neither of you is willing to take responsibility for your half of the well-being journey. Successful movement within the compassion space involves a shift toward well-being. When the self and the other are in the compassion space where this shift occurs, they experience a special type of growth-promoting relationship called the healing relationship. This relationship is often interpreted as sacred or a gift, and something that is allowed and not grasped. Once the healing relationship is established, then the shift toward well-being becomes a stepping stone for the other to use in his or her journey toward maintaining an improved quality of life. The self then becomes a witness stepping stone, using supportive words such as, “Remember I was there with you.” Then, as a witness, he asks the other person to recall how much better she felt after the event. This witnessing happens within the support relationship where both parties discuss how each person can follow his or her path to well-being. Growth-promoting relationships involve entering the compassion space in the roles of the self and the other. If we can understand the dance that takes place inside that space — the dance in which the relationship changes from healing to support, to resistance, and then back again — then we can more clearly envision our own path to well-being. Growth-promoting relationships are fundamental to success in the battle against chronic disease. Healthy relationships depend upon the successful communication of our needs to each other. If you are waiting for the other person to read your mind and recognize your needs, then you will be disappointed. Much of the suffering in the world happens when people do not enter the compassion space. Instead, they throw words at each other from inside their personally constructed self-bubbles. We think that we are safe inside our self-bubbles. But we can’t hear the needs of the others in our lives from inside our bubbles and this hinders our ability to develop growth-promoting relationships. Our caregivers need our attention and compassion. The others in our lives help us to mirror ourselves and provide us with support in our battle against our chronic illness. Use of the compassion space helps us to express our individual needs and feel heard. It takes practice to move around in the compassion space, and the CHRONDI elements help us with this practice. Have you had experiences within the compassion space? Did you like anything that was expressed in this column? Please share your thoughts in the comments to help other readers gain a broader perspective on helping and receiving help from others. The post Others Provide Support and a Mirror Within the ‘Compassion Space’ appeared first on Parkinson’s News Today. Life, liberty, and the pursuit of happiness. The H in the CHRONDI Creed refers to happiness. Happiness can be an elusive thing when battling a chronic disease like Parkinson’s. So many things can get in the way of experiencing happiness: pain, deep fatigue, irritability, the time consumed by the disease, and grief accompanying things stolen by the disease. Trying to hold on to even small moments of happiness is challenging. However, it is possible to experience moments of happiness in the face of chronic disease if one trains the brain to hold the moment gently — not too tightly. Happiness is a state of mind and includes a broad range of phenomena, such as gratitude, inspiration, accomplishment, beauty, awe, laughter, compassion, tranquility, joy, love, exhilaration, ecstasy, and bliss. The experience of happiness can have a connection to one (or several) of these phenomena. Before you finish reading this column, let’s take a mental excursion together. Visualize in your mind the last time you were happy and try to feel how you felt at that time. Try to hold the moment gently. Pause now to do that before reading on. Were any of the above phenomena part of your memory? Remembering happiness is helpful in reminding us what it felt like and of what the experience may look like again. It can help us to see it in the smallest of moments throughout our lives. It is not a practice of grasping after happiness. Happiness is like a butterfly flitting from flower to flower. We take in the beauty and the rich, sensual experience and hold it gently in our mind. If we were to grasp the butterfly, we would destroy the experience. Gently holding happiness without grasping is tied to a compassionate way of being. So much of our unhappiness is tied to grasping, to misperceptions, objectification, and poor communication in relationships. The practice of compassion is about experiencing the needs of others and then moving beyond suffering to a place of well-being. It is a shift in perception and out of suffering. Walking the path of the compassionate warrior is filled with happiness experiences accompanied by the knowledge of empathy, shifting perceptions, and shared well-being. Scrooge in Charles Dickens’ “A Christmas Carol” wasn’t happy until he experienced a shift in perception and became compassionate. I don’t expect to experience happiness all the time. That’s just too unrealistic for where I am in my personal development as a compassionate warrior battling a chronic disease. I seek small moments each day, not by grasping for them but by looking for them, like looking at the butterfly, and then gently holding the moment in my mind. Then, I am very grateful for that moment and not sad when it naturally fades into the next experience as part of the day. This feeling of happiness is not induced by drugs or alcohol (which bring fake happiness and negative consequences). It is a happiness that comes from the practice of allowing the mind to experience both the large and small moments of happiness. I do my best to begin and end each day with a confirmation (a mantra or a prayer) of specific gratitude — not a statement of general gratitude but one aimed at something specific in my life. Gratitude is a way of holding the door open for those happiness moments. Perhaps happiness brain training can be very helpful for those suffering from PD because of the link to dopamine production. I haven’t seen any research on this, but I find the practice to be quite helpful. What do you think? Are there methods you use to bring happiness into your life? Share them in the comments. Let’s pool together a collection of happiness tools for our readers. The post Holding On to Happiness, but Not Too Tightly appeared first on Parkinson’s News Today. “C” is for compassion in my CHRONDI Creed, a warrior’s guide in the battle against Parkinson’s disease. It may seem odd to label a warrior as compassionate. Normally we picture the warrior as fierce, brave, courageous, and strong. We don’t often associate compassion with such an image. However, in the battle against chronic disease, being both a warrior and compassionate person has important benefits. The compassionate warrior brings a special set of armor and weapons. Compassion is the mindset upon which the strength and courage of a warrior are set in motion. I have defined compassion as empathy plus wisdom; empathy is the ability to sense and hear the suffering of others, while wisdom is the ability to do something to reduce that suffering. Compassion is about the reduction of suffering in the world. The first step to becoming a compassionate warrior is making a commitment to a life of compassion, or having a philosophy of compassion. The second step is to realize that you can change your behavior so that you contribute less to the suffering of those around you. The third step is realizing that you can act in a way that helps reduce the suffering of those around you without sacrificing your well-being. In fact, this path of the compassionate warrior promotes personal well-being. The challenges of living with PD are many. The most obvious are the motor and coordination issues that impact every movement. There are also equally impactful emotional issues such as impulse control, grief, loss, depression, anxiety, and anger. Also included is a decreased ability to manage those emotions. When the actions connected to these emotions spill out into life, the consequences can be costly and add to an already arduous chronic disease battle. The biggest contributor to human suffering is the objectification of the other person, which often happens when emotions overflow. This is where the practice of compassion plays an important role. Practicing compassion is very much a scenario looping skill, and as such, it is good brain training for people with Parkinson’s. Without doing so directly, the practice of compassion helps us to moderate those emotions and decrease their consequences. It may seem odd to say that acting compassionately has selfish benefits. That’s not the goal of compassion or its mindset, but those benefits are simply positive side effects. Compassion focuses on the other person. The skill at which a person can do this depends on their history with practicing compassion. You don’t have to be an expert to have it make a difference. Practicing compassion at any level is good for relationships, and healthy relationships improve the quality of life for anyone with a chronic disease. The compassionate mindset is also one of gentleness, which can be (and should be) applied to self in healthy doses. Being a compassionate warrior does not mean we sacrifice our well-being for the sake of another. Two people in a rowboat, both manning the oars, makes the journey easier. Compassion, after some practice, can move from contemplated action to the first action taken. It then becomes the first thought considered, which then becomes living as a compassionate warrior. I have been training as a compassionate warrior for decades, and PD has set me back. As a compassionate warrior, I continue to work as hard as any warrior would when preparing for battle. The compassionate warrior does this preparation along with meditation and a calm mind. It is a commitment to a way of living that’s foundational for the other parts of the CHRONDI Creed. Additionally, the other parts of the CHRONDI Creed help to support this foundation to becoming a compassionate warrior against the chronic disease of Parkinson’s. It is not easy to become a compassionate warrior in the battle against PD, but the benefits are worth the effort. What is your experience in applying compassion in your life? The post The Compassionate Warrior in the Battle Against Parkinson’s appeared first on Parkinson’s News Today. The post The CHRONDI Creed: A Guide for Parkinson’s Warriors appeared first on Parkinson’s News Today.